If you missed the recent Local Property Tax (LPT) deadline, there is still time to avoid interest and penalties on late registration and payment. Revenue have confirmed that you can still file your Return (via paper form or online) before 1 July without incurring any interest or penalties (see here if the link fails, or is unclear). However, it is important to do act quickly. If you delay, Revenue may in the meantime seek to have the tax deducted directly from your wages or occupational pension. 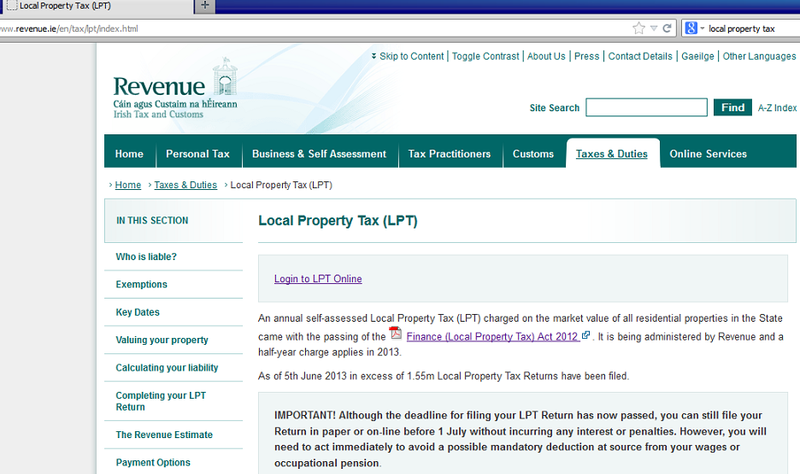 The Revenue LPT helpline remains open at 1890- 200255. If, like me, you don’t like overpaying for 1890 phone calls, you can call 01-7023049 instead. The telephone helpline requires callers to hold for over 30 minutes. The information on the website is untrue – states letters were “received” by householders when it should say letters “issued to”, as I never received any communication whatsoever from Revenue. knew of any widgets I could add to my blog thqt automatically tweet my newest twitter updates.